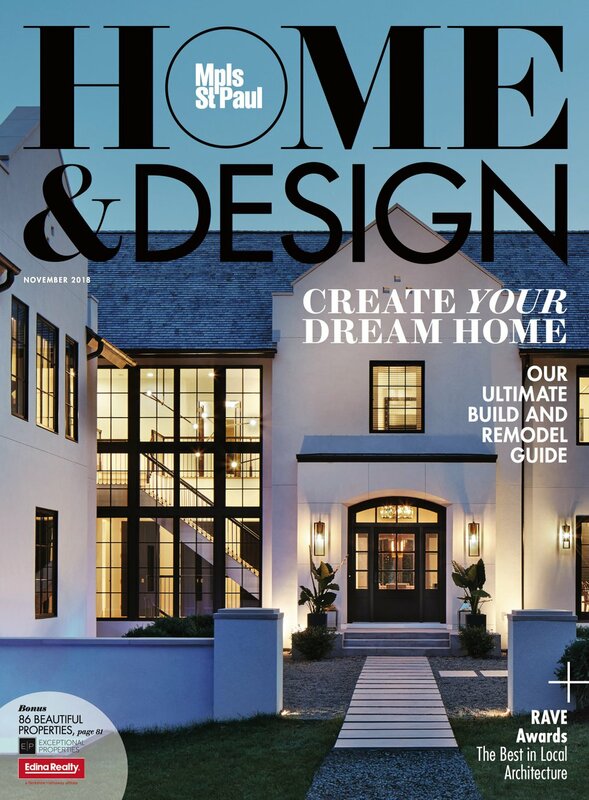 Resources from the November 2018 issue of Home & Design Magazine. Interior design by Anne McDonald, Anne McDonald Design, 651-248-6368, annemcdonalddesign.com; design and build by Jim McDonald, McDonald Remodeling, 6015 Cahill Ave. E., Ste. 100, Inver Grove Heights, 651-554-1234, mcdonaldremodeling.com. Living Room: Linen sofas, from Restoration Hardware, restorationhardware.com; Reese cocktail table in Cerused Oak, from Serena & Lily, serenaandlily.com; vintage pine armoire, from Loft Antiques, 3022 W. 50th St., Mpls., 612-922-4200, loftantiquesmpls.com; slate surround fireplace, from Fireside Hearth & Home, fireside.com. Bar: Brass cabinet, from CB2, cb2.com; alabaster lamp base, from Chairish, chairish.com; black lamp shade, from Michael’s, michaels.com. Hallway: Mirror, homeowners’ own; velvet bench, Ballard Designs, ballarddesigns.com. Dining Room: Table, from Pottery Barn, potterybarn.com; chairs, from Magnolia Home, magnoliahomefurniture.com. Kitchen: Bamboo bar stools, from Restoration Hardware, restorationhardware.com; island paint, in Midnight, from Benjamin Moore, benjaminmoore.com; lights above island, from Circa Lighting, circalighting.com; light above sink, Cone Pivot Shade Wall Lamp in brass, from Shades of Light, shadesoflight.com; countertops, in London Sky, from Corian Quartz, coriansquartz.com; white oak wood shelves and hood, custom made, by Jim McDonald, McDonald Remodeling, 6015 Cahill Ave. E., Ste. 100, Inver Grove Heights, 651-554-1234, mcdonaldremodeling.com; sink, by Whitehaven, from Kohler, kohler.com; wall and backsplash tile, by Gemma, in Bianco Matte, from Tile by Design, 1720 Annapolis Ln. N., Plymouth, 763-551-5900, tilexdesign.com. Mudroom: Wallpaper, in Palmetto, from Serena & Lily, serenaandlily.com; light, classic Americana ceiling semi-flush ceiling light in polished chrome, from Shades of Light, shadesoflight.com; floor tile, in Old Chicago brick, from Ceramic Tileworks, IMS and Maple Grove, 612-333-7100, ceramictileworksmn.com. Bathroom: Rotunda wall mount faucet, in chrome, from Signature Hardware, signaturehardware.com; wallpaper, in Cloud Formation, from Anthropologie, anthropologie.com; vanity, custom design by Anne McDonald, Anne McDonald Design, 651-248-6368, annemcdonalddesign.com; sconces, from Rejuvenation, rejuvenation.com; rug, from eSaleRugs, esalerugs.com; Builder Basic hexagon floor tile, in matte black, from Ceramic Tileworks, IMS and Maple Grove, 612-333-7100, ceramictileworksmn.com. Master bedroom: Vintage oak bench, from Loft Antiques, 3022 W. 50th St., Mpls., 612-922-4200, loftantiquesmpls.com; Blake Raffia Nightstands, from Serena & Lily, serenaandlily.com. Architecture, by Jeff Murphy and T.J. Majdecki, Murphy & Co. Design, 811 Glenwood Ave., Ste. 250, Mpls., 612-470-5511, murphycodesign.com; interior design, by Sandy LaMendola, Twist Interior Design, 811 Glenwood Ave., Ste. 350, Mpls., 612-338-1588, twistinterior.com; build, by John Kraemer, John Kraemer & Sons, 4906 Lincoln Dr., Edina, 952-935-9100, jkandsons.com; landscape design, by Scott Ritter, TOPO, 530 N. 3rd St., Ste. 401, Mpls., 612-929-2049, topollc.com. Architecture, by Gabriel Keller and Carl Olson, Peterssen/Keller Architecture, 2919 James Ave. S., Mpls., 612-353-4920, pkarch.com; interior design, by Linda Engler, Engler Studio Interior Design, 3948 W. 50th St., Ste. 204, Edina, 952-564-6488, englerstudio.com; Build, by Bob Near, Streeter and Associates, Wayzata, 952-449-9448, streeterhomes.com. Kitchen: Table, custom design, from Engler Studio Interior Design, Edina, 952-564-6488, englerstudio.com; Anziano chairs, in custom finish, from Donghia, Inc., donghia.com; Mac pendant lights, from The Urban Electric Co., urbanelectricco.com; Hurley sconces franking sink, also from The Urban Electric Co.; countertop, in Belgian Blue Limestone honed 3 cm slab, from Amsum & Ash, 30 52nd Way NE, Mpls., 763-571-8400, amsumash.com; cabinet hardware, from Ashley Norton, ashleynorton.com; range, from La Cornue, lacornueusa.com. Porch: Swing, custom design and fabrication, from Engler Studio Interior Design, Edina, 952-564-6488, englerstudio.com; fabric for swing cushions, from Perennials Outdoor Fabrics, Inc., perennialsfabrics.com; fabric for swing pillows (discontinued), from Donghia, Inc., donghia.com; Capri outdoor wing chair, from Palecek, palecek.com; chair cushion fabric, in Poolside in Sand Pearl from the Great Outdoors collection, from Holly Hunt, IMS, Ste. 234, 612-332-1900, hollyhunt.com; fan, in Galvanized with natural wood blade, from Rejuvenation, rejuvenation.com. Living Room: Nouvelle queen sleeper loveseat, from Taylor King, taylorking.com; fabric for loveseat, “Toccata” in Banya, from Hancock & Moore, Inc., hancockandmoore.com; ottoman, “Calvary Bench” in Stampede Harness Leather, also from Hancock & Moore, Inc; Cooper sofa, from Ferrell Mittman, ef-lm.com; fabric for sofa, “Linen Duck” in Oatcake, from Rogers & Goffigon, Ltd., rogersandgoffigon.com; cocktail table, 1900s French steamer trunk, rug Afghani hand-knotted wool rug, kantha pillows on sofa and loveseat: homeowners’ collection. Dining Room: Gothic Neo Geo Chandelier in Natural Brass, from O’Lampia Studio, Inc., olampia.com; Table, custom design, from Engler Studio Interior Design, Edina, 952-564-6488, englerstudio.com; Merci chairs, from Jessica Charles, jessicacharles.com; fabric for Skye chairs, in Blueberry, from Rogers & Goffigon, Ltd., rogersandgoffigon.com; chair trim, Round Nailhead in Antique Silver, from Samuel & Sons, samuelandsons.com; oars, from Sanborn Canoe Co., sanborncanoe.com; fireplace surround, Dove White Vein-Cut Honed Marble, from Eden Valders Stone, evstone.net; fireplace screen, from Restoration Hardware, restorationhardware.com. Entry: Philadelphia Windsor Arm Bench, from Countryside Amish Furniture, countrysideamishfurniture.com; Japanese Paper Weave 1616 Wallpaper, from Phillip Jeffries, Ltd., phillipjeffries.com; artwork above bench, by James Beaman, from Circa Gallery, 210 N. 1st St., Mpls., 612-332-2386, circagallery.org; chandelier, vintage Murano, from First Dibs, firstdibs.com. Dining Room vignette: Console, from Scout Chicago, chairish.com-shop-scoutchicago; table lamp, Mimizan ceramic, from Vaughan Designs, Inc., vaughandesigns.com; birds on console, from Gallery 360, 3011 W. 50th St., Mpls., 612-925-2400, gallery360mpls.com; framed artwork, by Kathleen Waterloo, from Circa Gallery, 210 N. 1st St., Mpls., 612-332-2386, circagallery.org; portholes, homeowners’ collection. Sink, from the Shaws Original collection, from Rohl, rohlhome.com; faucet, Henry Three-Hole Gooseneck Faucet in Unlacquered Brass, from Waterworks, waterworks.com. Bath: Tile, Eastern Promise encaustic tile in Marine and Milk, from the Majorelle collection, from Ann Sacks, annsacks.com; Iron and Rope mirror, from Restoration Hardware, restorationhardware.com; towels, from Serena & Lily, serenaandlily.com; Brockway sink, from Kohler, us.kohler.com; Cannock faucets with soap dish, also from Kohler. Accent table, 1920s French gueridon bistro table with marble top, homeowners’ collection. Architecture, by Ron Brenner, Ron Brenner Architects, 226 E. Myrtle St., Stillwater, 651-342-1278, ronbrennerarchitects.com; Build, by Kate and Kerry Hage, Hage Homes, 10218 Hage Dr., Rogers, 763-286-3369, hagehomes.com; Interior Design, by Sharon Seitz, HISTORIC Studio, 607 E. Lake St., Wayzata, 952-381-9899, historicstudio.com. Resources from the September 2018 issue of Home & Design Magazine. Entry: wallpaper, in dark floral, from Ellie Cashman Design, elliecashmandesign.com. Sitting Area: Wing chair, from Craigslist, minneapolis.craigslist.org, in Chivasso DON fabric, from KDR Showrooms, IMS, Ste. 408, Mpls., 612-332-0402, kdrshowrooms.com, reupholstered by Union Place Home Entertainment and Design, 361 George St., Excelsior, 952-474-5330, unionplace.com; rug, from eSaleRugs, esalerugs.com; wall color, in Chantilly Lace, from Benjamin Moore, benjaminmoore.com. Living Room: Rug, from Pottery Barn, potterybarn.com; coffee table, from Retro Wanderlust, 8 12th Ave. S., Ste. 8, Hopkins, 612-760-2600, retrowanderlust.com; fireplace screen, from H&B Gallery, 2730 Hennepin Ave., Mpls., 612-874-6436, handbgallery.com; chairs, also from Pottery Barn; throw pillows, from Z Gallerie, Galleria, Edina, zgallerie.com; martini side table, from West Elm, westelm.com; candlesticks, also from Retro Wanderlust; odalisques, from Home Goods, homegoods.com; mirror, from Wisteria, wisteria.com; topiaries, from Ballard Designs, ballarddesigns.com. Kitchen: Shades, from Smith and Noble, smithandnoble.com; floor, by Merola Tile Twenties Classic, from Home Depot, homedepot.com; cabinet color, in San Antonio Grey, from Benjamin Moore, benjaminmoore.com; wall and trim color, in Chantilly Lace, also from Benjamin Moore. Bathroom: Wallpaper, in Chenonceau Charcoal, from Schumacher, fschumacher.com; rug, from eSaleRugs, esalerugs.com; shade, from Smith and Noble, smithandnoble.com. Guest Room: Wallpaper, in petit feu greige, from Schumacher, fschumacher.com; rug, from Ballard Designs, ballarddesigns.com; sconces, from West Elm, westelm.com; headboard, from Wayfair Rico, wayfair.com; nightstands, from Anthropologie, anthropologie.com; tumbling block tray, from Jayson Home, jaysonhome.com; brass elephant, from Retro Wanderlust, 12 Ave. S., Ste. 8, Hopkins, 612-760-2600, retrowanderlust.com; bedding, also from Anthropologie; throw pillows, from Pottery Barn, potterybarn.com; curtains, also from West Elm; curtain hardware, tailoring and natural woven shades, from Union Place Home Entertainment and Design, 361 George St., Excelsior, 952-474-5330, unionplace.com. Dressing Room: Rug, from Anthropologie, anthropologie.com; velvet ottoman, also from Anthropologie; shades, from PBTeen, pbteen.com; clothing racks, from Ikea, ikea.com. Master bedroom: Wallpaper, in dark turquois, by Thibaut Venus, from AJ Maison, aj-maison.com; wall color, in Hague blue, from Farrow and Ball, us.farrow-ball.com; headboard, from Anthropologie, anthropologie.com; curtains, from Pottery Barn, potterybarn.com; curtain hardware, tailoring and shades, from Union Place Home Entertainment and Design, 361 George St., Excelsior, 952-474-5330, unionplace.com; rug, by Capel Kasbah, also from AJ Maison; lamps, from Arteriors, arteriorshome.com; bedding, from Pottery Barn, potterybarn.com; throw pillow, from Ballard Designs, ballarddesigns.com. The Ann Cave: Paint color, in Lafayette Green, from Benjamin Moore, benjaminmoore.com; floor, by Florida Tile, from MN Tile and Stone, IMS, Ste. 123, Mpls., 612-330-9899, mntile.com; rug, from West Elm, westelm.com; wallpaper, in Ethan Tartan Hunter, by Ralph Lauren, from Kravet, kravet.com; custom media stand, from Ikea, ikea.com; leather sectional, also from West Elm; floor lamp, France & Sons, franceandson.com; lamp, from Target, target.com; blanket, Faribault Woolen Mills Co., faribaultmill.com; chairs, by MadwomanNOLA, from on Etsy, etsy.com/shop/MadwomanNOLA; leopard throw pillows, from Arianna Bell, ariannabelle.com; bird throw pillows, by TeaLadyPillows, from Etsy, etsy.com/shop/TeaLadyPillows; hanging wall shelf, also from West Elm. Contracting by Flannery Construction, 1375 St. Anthony Ave., St. Paul, 651-225-1105, flanneryconstruction.com; interior design by Jacqueline Fortier, 1161 Selby Ave., St. Paul, 651-428-6508, jacquelinefortier.com. Mudroom: door by Simpson Door Company, simpsondoor.com; paint on door in Brattle & Spruce from California Paints, californiapaints.com; antique Swedish bench from R E Steele Antiques, instagram.com/r-e-steele-antiques; Girls’ bedroom: bed and dresser by Chelsea House, from Zachary Ltd., IMS, 612-338-6250, imsdesigncenter.com; wall sconce from YLighting, ylighting.com; vase on table from Heath Ceramics, heathceramics.com. Full bath: Tub filler by Lefroy Brooks, lefroybrooks.com; windows by Marvin Windows and Doors, marvin.com; wall tile in Encaustic by Sabine Hill from Fantasia Showrooms, IMS, 612-338-6250, imsdesigncenter.com; floor tile by Artistic, also from Fantasia Showrooms. Master bedroom: Fabric on bed and curtains from Bennison Fabrics, bennisonfabrics.com. Throughout: Wall color, in Pure White, from Benjamin Moore, benjaminmoore.com. Entryway: Table, custom, by North Lakes Wood Garden, 32056 North Lakes Tr., Lindstrom; painting, from Minted, minted.com; lamp from CB2, cb2.com. Living room: Grey chairs, custom, from Tapis Decor, IMS, Mpls., 612-359-6007, tapis-decor.com; black Wassily chairs, from Knoll, knoll.com; floor lamp, by Tolomero, from Design Within Reach, dwr.com; pillows, from Tuesday Morning, tuesdaymorning.com; cocktail table, custom, through Lucy Interior Design, lucyinteriordesign.com; accessories on cocktail table, from West Elm, westelm.com; rug, also from Design Within Reach. Dining room: Hammered brass table base, from Bungalow 5, bungalow5.com; Carrara marble tabletop, from Knoll, knoll.com; dining chairs, by Montis, from Roam Furniture & Lighting, roaminteriors.com; sconces, from France & Son, franceandson.com; painting, by Brad Durham, represented by Circa Gallery, 210 N. 1st St., Mpls., 612-332-2386, circagallery.org. Master bedroom: Lamp, from France & Sons, franceandson.com; nightstand, by Nuevo, from Tapis Decor, IMS, Mpls., 612-359-6007, tapis-decor.com. Secondary sitting area: Art, Vitesse No. 4 by Henri Boissiere, from Room & Board, roomandboard.com; end table, by Bright Furniture, from Blended Blue, IMS, Mpls., 612-455-6132, facebook.com/BlendedBlue. Guest bedroom: Headboard wall fabric, by Elitis, from Blended Blue, IMS, Mpls., 612-455-6132, facebook.com/BlendedBlue.